A lot of people don’t realise that you can also use these .vhd files to restore individual files and folders without having to restore the entire image. This is useful when you need to reinstall Windows from scratch, as you can remain confident that you have backed up absolutely everything from your existing installation. 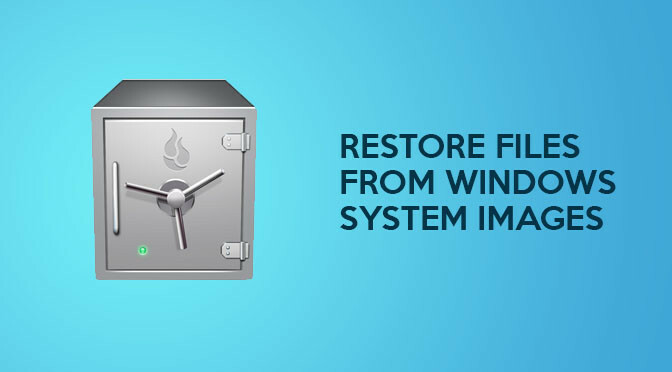 Make sure you have created the system image and stored it on an external hard drive. Have your PC booted into Windows and plug in the external hard drive. Open ‘Computer Management’ console. (Go to ‘Start > Run and type compmgmt.msc’ and press OK. Or go to ‘Start > right-click on ‘Computer’ and select ‘Manage”). Under ‘Storage’ select ‘Disk Management’. On the menu bar at the top select ‘Action > Attach VHD > Browse to your .vhd file and select it’. Uncheck the ‘Read-Only’ checkbox and press OK. If you followed the steps correctly, your virtual hard disk will now appear as another hard-drive on your computer and can be accessed as such, you can copy and paste files and folders from it onto your physical hard drive. You may need to check for Read-Only permissions and Security Permissions and set them accordingly if you have any difficulty viewing or copying files. Once you are finished you can return to the Computer Management console, go to Disk Management and right click on the virtual hard drive shown in the list and detach it. Make sure you uncheck the ‘Delete the virtual hard disk file after removing the disk’ checkbox. Another word of warning, if you Cut items from the virtual disk it will remove them from the VHD file when you paste them elsewhere. Stick to using Copy if you wish to keep the VHD intact.